Do you like dark chocolate? 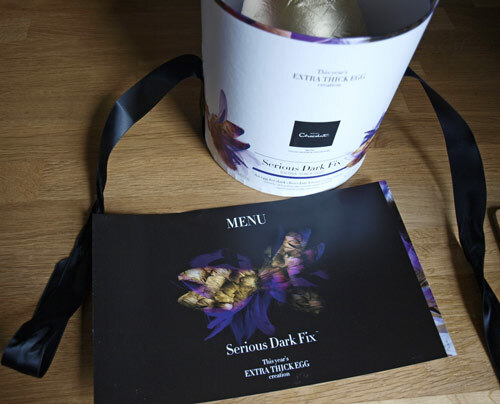 Because if you do, you just have to have this Hotel Chocolat Serious Dark Fix Extra Thick Egg Creation on your wish list for Easter! 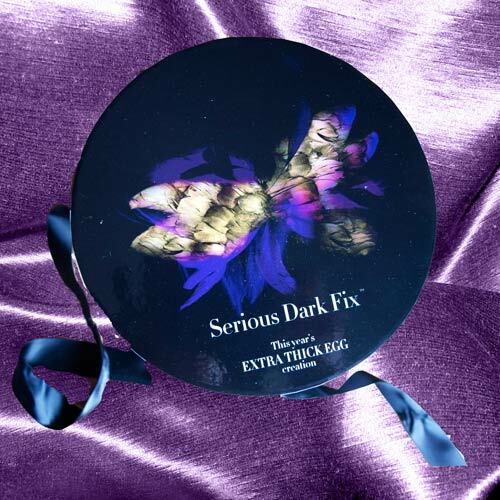 How could you or your partner resist this amazing 'hat box' packaging? 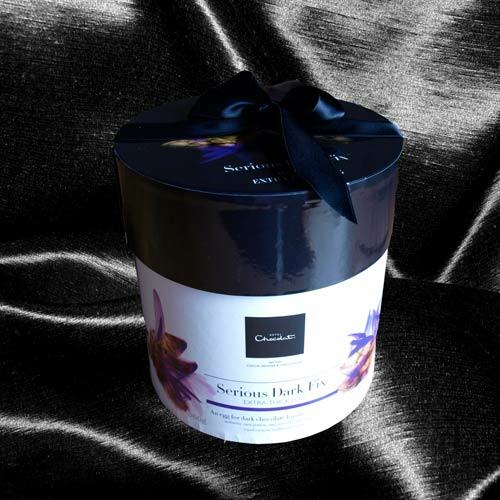 So luxurious and tempting, just waiting for you to pull the ribbon and uncover the contents. 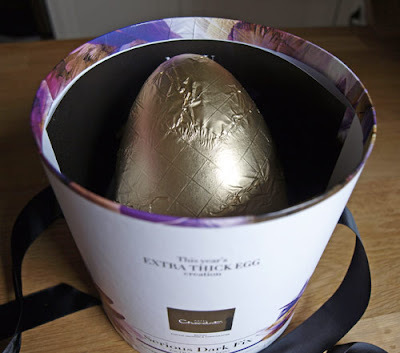 Lid off and the golden egg is revealed, nestling on it's own little moulded throne, are you excited yet? The 'Menu' reveals that this is not just a dark chocolate egg, oh no, it also contains some delicious choccies. Black Cherry Truffle: I love black cherries and this chocolate doens't disappoint, not too sweet with enough tang to cut through the white chocolate interior. 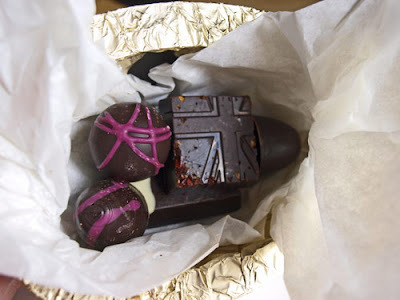 Raspberry Liqueur Truffle: definitely something alcoholic, but not a huge raspberry hit. Salted Soft Caramels (Dark): I'm a sucker for a salted caramel and the dark chocolate works well with the sweet and salty caramel. Chilli Pralines (Dark): This was the first chocolate I tried as I love chilli and chocolate, but I was a wee bit disappointed there wasn't much in the way of chilli bite, I suppose they don't want to frighten off those unused to chilli in their chocolate, but I would have liked a bit more. Espresso Truffle (Dark): My husband pronounced that this definitely tasted like Espresso! Rum Truffle (Milk): The rum takes a moment to hit, but there is enough there to give that lovely warm sweet taste. 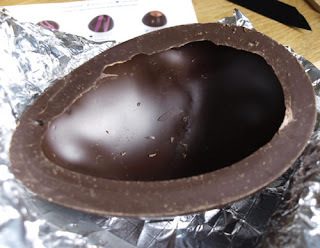 No pathetic thin chocolate egg shell, but a thick and luscious one, it's not quite as thick as the edge all the way through (thank goodness, or you would never break it!) but a lot thicker than most chocolate eggs. I have to say I was very excited when the postie drew up in his van this morning and I saw him emerge with an egg sized cardboard box. 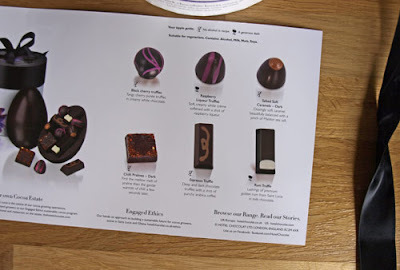 I've reviewed a few Hotel Chocolat chocolates, but this has to be my favourite, not only is the egg thick and delicious, the chocolates varied and plentiful, but you get that fabulous box which, to a crafter, just calls out to be altered into something that will last forever! Don't worry if there is no Hotel Chocolat shop near you, you can buy online and I can certainly vouch for the eggs arriving beautifully packaged and totally intact. If you are not a fan of dark chocolate there are lots of other delicious eggs and novelty Easter chocolates to choose from. Wow Janice from your description I can say that that egg sounds delicious and my mouth is watering. Mmmmmmmmm, that does look good Janice. I have had one of their thick eggs before and they are really excellent. 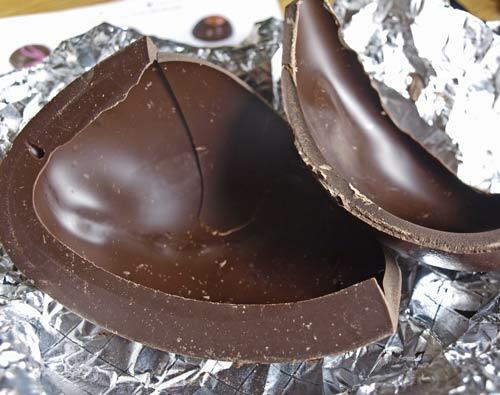 I've got a thick egg too, but milk chocolate which I'm very happy with. My mother, on the other hand would love this.